There’s a new podcast out on the airwaves, and it’s helping you overcome your stickiest workplace dilemmas. 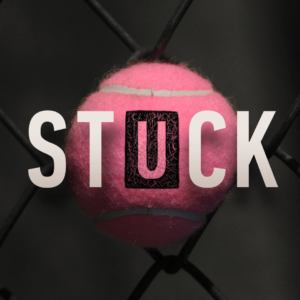 STUCK is a business-focused podcast created by Damian Bazadona, Founder & President of CTI sponsor Situation, and Rachelle Pereira, Co-Founder of EQUALibrium Group. Each week, the duo works together to provide actionable tips for moving through common conundrums in the workplace. Over six episodes, Damian and Rachelle exchange their views on everything from creating a diverse and inclusive workplace to preparing to give feedback to your boss. Once they hear a question, they only have five minutes to think about it before weighing in and trying to find a solution – together and unfiltered. Before Damian became a world-famous Mad Men-inspired marketeer, he was a kid with mediocre record spinning skills and a gift for creating diehard fans. Today, he leads Situation – a digital agency that’s best known for creating passionate communities for some of the world’s biggest brands. Under his leadership, the agency has won numerous workplace awards from Crain’s, Best Companies Group, Cynopsis, Digiday, and Fortune. Rachelle originally started her career as a counselor in Northern England, working with doctors and surgeons on basic skills like active listening, providing clear explanations and generally not behaving like a**holes. This led into a successful consulting practice that took her to NYC. In 2016, she co-founded EQUALibrium – a leadership development company that is best known for helping clients support and build Powerful Modern Leaders. To listen to this six-part series, subscribe on Apple or anywhere you listen to podcasts. There are four episodes currently released and season two is already in the works. Got a workplace problem for the duo? Submit it here for a chance to be answered in the next season. Got a logistical question for Team STUCK? Contact the press team for more. 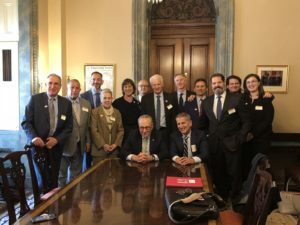 A committee of Broadway League members is getting ready to head for Washington, DC next week to engage with senators, congresspeople and their staffs about issues of importance to the Broadway community. The League’s Government Relations Committee and Legislative Council have become increasingly active in pursuing legislative and regulatory issues and we’ve had a good deal of success over the last few years. Several of the issues affect our investors (and ourselves) and without our careful attention, we’d be at a serious disadvantage. Three years ago, we were successful at gaining parity with the film industry in being able to write off all our capital costs in the first year of production instead of having to write them off over several years. That eliminated what’s called “phantom income,” which was a great irritant to investors who were being saddled with taxable income before they actually had profits. It took years to accomplish and many conversations but, as a participant, I can tell you it was a fascinating and uplifting experience. Contrary to the impression sometimes left in the press, I met many smart, dedicated and well-informed public servants who give me hope for the future of our government. This year, one of our main issues will be to ask congress to fix a Treasury ruling that our production companies are not entitled to the 20% reduction in taxable income that most pass-through companies, like our LLCs, are getting under the new tax law. If that stands, it will put us at a disadvantage in raising money from investors who have a choice of private investments, most of which will enjoy the 20% edge. 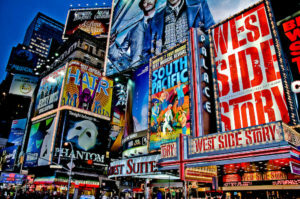 Subsidiary rights are the rights to license productions of a play or musical that the producer of the Broadway production does not obtain in the agreement with the author. Typically, the producer will bargain for the right to do a Broadway production and all the types of developmental steps that precede a Broadway production. Usually, the producer will also get options to produce a North American tour and commercial sit-down productions, commercial productions in London and tours in the UK and Australia/New Zealand. Some producers may also want to get options to produce in other, non-English speaking territories. 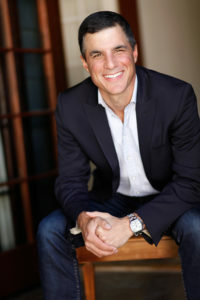 That leaves a lot of potential exploitation in the hands of the author, including motion picture and TV productions, stock and amateur productions, such as in high schools or regional theaters, and foreign language productions. Income from these productions is called subsidiary rights income. The agreement between author and producer will grant the producer a share of the income from these sources. Along with all the other rights the producer gets from the author, this right will be contributed by the producer to the Broadway production (which is referred to as the “mother company”). There are several formulations for sharing this income between the author and the Broadway production. In each formulation, the production will share in the income for a finite period of time, after which the income will belong entirely to the author. A pink contract refers to an agreement between The Broadway League on behalf of its members and Disney Theatrical Productions, and the International Alliance of Theatrical Stage Employees (I.A.T.S.E). Individuals who hold a “pink contract” are often called “pinks” or “pink contract crew” and are employed directly by the production. These include stagehands, wardrobe personnel, make-up artists, hairdressers and motion picture operators on touring shows and Broadway. They frequently work out-of-town tryouts and then come with the show to Broadway. Pinks represent the production, and work side-by-side with local Union stagehands who are employed by theater owners (e.g. Local One in NY). Pinks are sometimes referred to as “road crew” or “show crew” to distinguish between local or House crews. The term “pink contract” stems from the pink-colored paper on which the contracts were written. Hudson Scenic Studio is a premier provider of custom scenic fabrication, automation, and painted drops, servicing the live entertainment industry since 1980. The company is behind the precision automation systems that lower the New Year’s Eve ball in Times Square and the expertly crafted sets that mesmerize audiences on Broadway and on tour around the world. In 2007, Hudson opened its first Manhattan office, Hudson Theatrical Associates, to provide technical supervision, labor supervision, and production management for theater, industrials, and live events. Recent and current work from both companies include: Frankie & Johnny, All My Sons, Hadestown, Oklahoma!, Ain’t Too Proud, Be More Chill, The New One, American Son, Torch Song Trilogy, The Lifespan of a Fact, The Cher Show, Harry Potter & the Cursed Child, Hamilton, Aladdin, Lion King, Chicago, Phantom of the Opera. 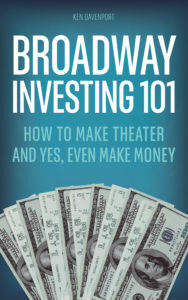 This week, CTI sat down with sponsor Ken Davenport to discuss his new book, “Broadway Investing 101: How to Make Theater and Yes, Even Make Money.” A Broadway veteran, Ken explains his theories on investing, breaking down the nuts and bolts for those new to the industry (or those who need a brush-up). Join us as we discuss the secret to lasting relationships, production longevity, inclusivity, and even the Amazon Coat! 1. What was the primary impetus for writing this book? Broadway has become hot these days with the success of shows like Dear Evan Hansen, Hamilton, and the NBC Telecasts. We’ve gotten international attention. I’ve found that there’s more people interested in investing in Broadway shows than ever before. I talk to a lot of these people because of my blog and because I speak at many events. The rise in potential investors is exciting for our industry, but I found there were a lot of questions. I wanted to make sure that people entered this world armed with the right information so that they didn’t make mistakes and then run away from us very quickly. I think that our business has been a bit of a gated community for many years and part of my mission is to bring down those walls a little bit. This book is one of those tools. 2. You mention in your book that you posted about seeking investors for Godspell on your blog, which prompted a flood of responses. How did you handle the high volume of inquiries? I made it a rule of mine that I would talk to every single person. I believe that investing in the theater is high risk, and people need to understand the risk and have the right expectations before they invest. I think that when someone gets upset about an investment that doesn’t work out (whether it’s on Broadway or in the stock market), it indicates that they had the wrong expectations going in and didn’t understand the risks involved. 3. Because you believe in Broadway investing being more inclusive, you set your minimum investments at relatively low values. What techniques do you use to handle the high volume of investors? It’s all about communication, there’s no question. I try to communicate as much as possible so that I can answer questions. I also do live events at times. For Godspell, I had shareholder meetings every quarter. I invited our investors to the theater, gave them an update, and usually had someone else involved in the show speak as well – the director, the advertising executive, etc… It’s about providing the experience of investing as well as the dollars and cents. 4. Aside from posting on your blog, how do you find your investors? Posting on the blog was something unique for Godspell because you can’t legally just post a note anywhere seeking investors. The blog pointed readers to the “People of Godspell” website, which had all the information about investing. That was a different type of offering, however, and it required a lot more regulation than regular investments. So, if I started raising money for my next new musical I wouldn’t just post on my blog. Most investments come from word of mouth, referrals, or people reaching out to learn more about my company and future projects. 5. In your book, you suggest that there be an alternative method to determining who legally can and can’t invest in a Broadway production. What ideas do you have in mind? The closest solution I can come up with is what I call a “Stress Test for Investors” which would not only examine the financial situation of the potential investor but also their understanding of the risk involved. I do think our legal paperwork right now does a good job of explaining the high risk of investing, but I think a very simple ten-question checklist would be useful. It would ask things like, “Do you understand that you may lose every dollar of your investment?” or “If you do lose this investment, will you be able to maintain your living expenses?”. The test would simply reinforce that people understand the expectations. I think this is one way in which we could allow more people to get involved. 6. In your experience, what’s been the key to maintaining a lasting relationship with your investors? Communication. I did a survey that found that the majority of investors weren’t disappointed when they lost money, but were disappointed if they didn’t know they were losing money. It’s about being honest. It’s a hard thing to do because no one likes to admit that things aren’t going so well, but you have to do it. That’s the key to long-term relationships for sure. 7. I appreciated the point you made about one of the primary challenges of selling a Broadway show; It’s a “non-essential” purchase, and you somehow have to make it a “must” product. What advice do you have in achieving this goal? Well most of those things that become “must haves” are the result of word of mouth making them hotter than anything else. Be More Chill is a great example. It had tons of buzz and every teenager needed to experience it live. Another is the Amazon Coat – one of the hottest selling coats on Amazon. It’s a women’s coat with tons of pockets and is warm and inexpensive. It started selling so quickly that news articles were being written about it. The word-of-mouth had taken off and sales heated up so much that it started to affect press, which got even more people talking about the coat, which in turn increased already significant sales. That’s when things become a must-have. So, it’s really word-of-mouth – there’s not much more you can do. You can’t advertise that kind of heat. I always say that advertising to achieve that level of market penetration is just like screaming at someone to buy something, and they’re not going to do that. They’re going to wait until their friends say, “You gotta go see this show!” or “You have to get this coat!”. 8. Could a review help or hurt that word-of-mouth? What I always find is that reviews are steroid shots to word-of-mouth and to a show’s life. If a show gets good reviews when it opens, ticket sales will spike, but they won’t stay up there unless word-of-mouth is good. So, a good review often will get a show through the period before their word-of-mouth has really hit. 9. You note in your book that for new productions, it’s important that the show be the star, rather than the show rely on a star. This may seem counter-intuitive to some of our readers. Can you elaborate on why this is an important consideration to make when selecting projects in which to invest? I’m a big data guy, and if you look at the ten longest running musicals of all time, only Chicago had a star in it when it opened. However, it was a revival, which puts it in a somewhat different category, and had Broadway stars, not Hollywood celebrities. The key to long-term success is finding shows that will resonate over decades. You can’t be dependent on the star like a movie. The Godfather will have Marlon Brando in it for the rest of eternity. Phantom will not have Michael Crawford in it for the rest of eternity, but that show is so good and resonant that it doesn’t matter. 10. So what makes a show resonate? That’s the secret sauce. I find my next projects by picking shows that I want to see, things that really resonate with me. I think I have a pretty good finger on the pulse of what the public wants to see because, frankly, that’s usually what I want to see. I think my tastes are generally aligned with the majority of Broadway audiences. I’m a theater fan at the end of the day. You can call me a producer, but I’m a theater fan, so I chose shows that satisfy that sixteen-year-old kid in me that drove in from Massachusetts wanting to see musicals. 11. How do you find your next project? Do you solicit scripts, come up with ideas on your own, attend tons of readings…? Yes to all those things. There’s no sure-fire method to finding a show. Your eyes and ears have to be open all the time. Sometimes I come up with ideas for shows of my own. I thought there was a musical in the Vacation movie franchise so I’m developing Broadway Vacation. My stock broker asked if I had ever considered a musical about Joy Mangano, so now I’m working on that. Once on This Island was pitched to me by Michael Arden. So, my projects come to me in a variety of different ways. 12. You explain in your book that the success of a show often depends on whether it resonates now. Looking at this year’s season, is there a specific genre, topic, theme, or issue you think is missing on Broadway? Well, Broadway has always been about adaptation, so I’m not going to say we’re missing new original musicals because there really never are that many of them. But I will say that we are very heavy on big brands right now. I think we’re over-weighted in big brands, where the emphasis is placed on a brand that makes a musical rather than a great story that makes a musical. I think there have been some choices to produce shows because there’s a built-in audience, not because the material is perfectly suited for a theatrical adaptation. 13. I’ve noticed more and more undergraduates attending CTI courses and complaining about a lack of producing education at the university level. As an NYU Tisch graduate yourself, why do you think this is, and what advice do you have for these undergrads? It’s a real challenge and it’s a real mission of mine to start to get institutions around the country and the world (including high schools) to establish the concept that being a producer is a career, not just a hobby. I think schools don’t want to teach producing because it’s entrepreneurial and relies on raising money. The success of raising money is dependent on the individual. For now, I think the best undergrads can do is try to learn a little bit of everything. The most successful producers out there are the ones that can speak the language of the writer, director, designer, and actor. When you can really get into that mix and talk, listen, and understand, you can create something great. And when you create something great, money will come to you. A tax liability can be defined as the amount of money an entity owes to tax authorities. These include local, state, and federal governments and can even reach across borders. Every entity is required to pay their fair share of taxes, but not every entity is taxed the same. Depending on the type of entity, the calculation may be different. For example, the calculation of taxable income and the rates of tax are different for individuals, corporations, partnerships and trusts. In the world of theater and entertainment, most organizations are built as Limited Liability Companies or Limited Liability Partnerships. These organizations do not pay taxes because income is passed through to the partners or members of the organization. The individual receives a K-1 with their portion of income from the entity and they are required to report it on their individual return. Many organizations elect to calculate and pay the tax liabilities for their investors. The organization will create an asset on their books equal to the amount of taxes paid on behalf of members, and repay themselves out of the calculated distribution the investor would usually be receiving. If the entity does not expect to be paid back by the partner or member, it is considered a distribution, and the basis of which the investor has in the organization is lowered. It is important to remember that all individuals and entities are responsible for fulfilling their own tax liability. For any help structuring a tax friendly organization or preparing your tax return, reach out to Withum Smith+Brown. With over 30 years of industry experience, our Theatre, Entertainment and the Arts Group understands the challenges businesses face within the sector, and offers practical solutions for film and TV productions as well as specialist services for individuals and small business with creative talents. Our clients around the globe benefit from the expertise and continuity of their engagement team and the rapport which develops in time from this crucial business relationship. The CTI Blog is thrilled to highlight a recent podcast, featuring our very own Tom Viertel. CTI sponsor Ken Davenport interviews Tom about everything from his past in real estate to his hopes for the future of off-Broadway. Take a listen to this exciting Q&A session, and be sure to check out a few other recordings while you’re there! 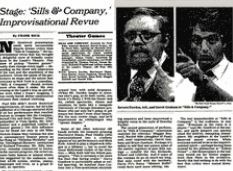 Back in 1986 when my partners and I were just starting our commercial producing careers, the second piece we produced was an entirely improvised off-Broadway show called Sills & Company. We had a cast that included some of the all-time great practitioners of improv and we were at the Lambs Theater (now the Lambs Club), a beautiful 300-seat venue. The show opened to mixed reviews and, because it was completely improvised every night, no two audiences saw the same show. Word of mouth was decidedly mixed because some nights were a lot funnier and pithier than others. Our mantra got to be “you shoulda been here last night!”. Performance after performance, we had half houses – about 150 people. We began to explore the possibility of moving to a smaller theater – say a 150-seat house – where our costs would be lower than at the Lambs and we imagined we’d be full every night. So, we scaled the show back and moved to the 150-seat Actors Playhouse. And every night, about 75 people showed up. It was maddening. But if you stay committed to producing over more than a few years, you’ll encounter crazy and mysterious things like that and probably spend the rest of your life trying to figure them out. I know I have. Mean Girls on Broadway isn’t a regular show. It’s a cool show. This week on the CTI Blog, Creative Strategist Carly Michaels gives readers a peek inside CTI sponsor Situation’s Burn Book (figuratively speaking, of course) to see how they turned Mean Girls into a sensation not only onstage, but also online. Remaking movies into musicals is nothing new, but today’s hyper-digital world poses a unique opportunity for shows to transcend the big screen to the stage to a mobile device. While nothing compares to the experience of seeing your favorite movie re-imagined on stage, social media has the power to give fans the chance to live that experience on an ongoing basis. 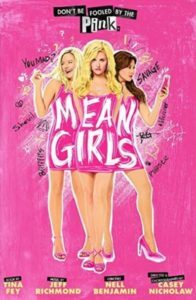 Mean Girls on Broadway has been challenged with taking a movie, so pervasive in the heart of pop culture, and bringing it to life on the Broadway stage. Moreover, it cleverly utilizes the iconic references and beloved characters to grow an audience of more than a quarter of a million people across the brand’s social communities. Below are five key takeaways on how Mean Girls on Broadway evolved from a pop culture movie to a pop culture musical (with must-follow social channels). 1. Own the iconic moments around the movie but make them your own. Shows with existing brand equity have an advantage to leverage moments associated with the brand and the pop culture zeitgeist. However, when it comes to marketing the show, it’s crucial to put your mark on an already universal moment. Take October 3rd, for example, a day that has historically been synonymous with “Mean Girls” the movie and is now a holiday in the world of pop culture. It was inevitable that the musical had to be a part of this trending moment but with a Broadway spin. And how did Mean Girls do that? By offering a free fan performance, leveraging the show’s cast and creative, and making the day all about the Broadway fans – not ticket sales. The musical made sure not to leave out the thousands of fans who couldn’t physically be at the show. For these “remote” fans, Mean Girls on Broadway released more than 168 unique pieces of social content so everyone could join the celebration. 2. Find new opportunities that expand on existing brand capital. It’s useful to lean into the movie’s iconic moments, but it’s essential to create new moments that are uniquely associated with the musical. Behind the scenes, Mean Girls on Broadway has stayed abreast of moments that could be own-able to just the show. Musicals inherently have the advantage of providing a more in-depth look into characters. For example, in the musical, Damian Hubbard flaunts his super-fan status for all things “Ru Paul’s Drag Race,” specifically donning t-shirts of Alyssa Edwards and Bianca Del Rio. As tweets rolled in from fans of “Drag Race,” it was evident that Mean Girls needed to speak and engage with this specific community. The result? A panel and performances at DragCon in NYC, and a partnership that established a deeper and more authentic relationship between the musical and the drag community. 3. Bring the show and characters to life through content. Regina George, Cady Heron, Gretchen Wieners – these are all household names to millions of fans. What happens when you re-imagine these iconic characters for the Broadway stage? Social media and its ongoing feed of content allows musicals to share a multitude of perspectives and voices through the lens of their characters. When you think of “Mean Girls” the movie, you view the story through the eyes of the protagonist, Cady Heron. Through social media, the show has been able to lean into multiple characters’ unique voices from Queen Bee Regina’s calculated confidence to outsider Janis’ empowered sass. 4. Give all fans a voice. More than 13 million people attended a Broadway show in NYC in 2017-2018, according to the Broadway League. What about the millions of fans around the world that can’t make it to New York to see the show? That’s where social media has a huge opportunity to connect fans from all geographic locations into one centralized community. To celebrate its massive fan-base, Mean Girls launched an official Facebook Group where fans can share their love of the show and connect with each other. Through this group, the show created a home for thousands of super-fans, who are the first to engage with content and serve as brand advocates. 5. Make the music integral to your content strategy. You can’t shift audience perception from movie to musical without putting the music at the forefront. In 2017, there were 400 billion streams via streaming services, making social media the go-to place to share music. Whether it’s larger pieces of content like music videos or lyric-based visuals– it’s essential for fans to resonate with the music, because that’s unique only to the musical. By taking fans’ online behavior into consideration, the show leveraged social to establish an official fan bracket to determine the ultimate Mean Girls Summer Bop, just two months after the Original Broadway Cast Recording was released. The show not only gained insights of the songs fans resonated with most – but also saw the highest performing Instagram post to date. These takeaways go to show that the limit does not exist when it comes to re-imagining a pop culture movie into a pop culture musical. This week we go backstage into the versatile career of theatrical producer Ashley DeSimone, a 2014 graduate of the Commercial Theater Institute and CTI’s Eugene O’Neill Summer Workshop. Currently devoted to a variety of projects including DJEMBE!, Magic Mike Live in London, The Devil Wears Prada, Working Girl, and much more, Ashley took time out of her busy schedule to share the tricks of the trade. Learn about how her background on Wall Street eventually brought her to the Great White Way and beyond! Can you talk about what you’re working on now? You seem to be immersed in a little bit of everything and partnering with multiple people and companies. I am now lead producing my own projects as well as selectively co-producing projects. Let’s talk about lead producing first, because there is a huge difference between lead and co-producing, although both are incredibly important! My hope is that we blow people away and ensure they leave the theater with a sense of community that they just can’t get from Facebook or Instagram. Right now, I am lead producing a new, original project called DJEMBE! THE SHOW. We open in Chicago this April at the Apollo Theatre. It’s pronounced “jem-bey” and it’s what I call a “multi-sensory theatrical experience” because every seat in the theater has an African djembe drum on it. For about a quarter of the six-person, eighty-minute show, the audience plays along with the performers on stage. In addition, the show has world-class visuals and projections, as well as performances from Broadway talent. It’s not a dramatic narrative or story like in a play or a musical; It’s a concert. However, we do interact with the audience constantly, and there’s comedy and banter among the cast that keeps it engaging. I’d like it to live in the world of STOMP and The Blue Man Group. It is ageless, without borders, and able to evolve over time. Historically, the djembe was used in parts of Africa to gather communities together for all sorts of activities, from births to deaths to feasts. We almost called the show GATHER for this reason. The core of the piece is about community and the simple fact that we are all human with common needs for home, subsistence, and love. Because of this, our tagline is All Together Now. The singing and, of course, the music and percussion are spectacular. What’s particularly exciting is the transformative nature of the experience in which all four hundred people in the audience end up playing music together. We built the show from an earlier version that toured in France. What we learned from the experience there was that people left elated, and many came back over and over again. With the addition of Broadway-caliber creatives and designers, my hope is that we blow people away and ensure they leave the theater with a sense of community that they just can’t get from Facebook or Instagram. Beyond DJEMBE, I am also in development on new, original projects. I am currently working with playwright James Presson, country songwriter/composer/author/Nashville-based artist Rodney Crowell, and writers Zoe Sarnak and Emily Kaczmarek. Additionally, director/writer West Hyler and I are producing Pure Chaos, a Theater For Young Audiences piece, this spring at a museum space. I am excited about all of these projects! Let’s now talk about co-producing, which involves investing and managing my and other peoples’ money in live entertainment. Nothing can happen in this industry without the investors who are willing to back the lead producers, the artists, and the projects. I think it’s very important that co-producers invest personally with their investors so that their interests are aligned. I handle investing via my formal investment platform, Fortune Theatrical Ventures. I still enjoy co-producing because I manage a portfolio of investments for a dedicated group of theater enthusiasts who want to own what they love. The deal-side of theater is very interesting to me and I have been lucky enough to access a lot of different and exciting ones, which is doable given my financial background. I’ve also been fortunate to learn from some of the leading producers and lawyers in this industry. Co-producing also affords me the ability to constantly access projects led by great producers who I trust. I am a co-producer on Magic Mike Live in London, Kevin McCollum’s project, The Devil Wears Prada, written by Elton John, Shaina Taub and Paul Rudnick, and Robin Goodman’s project, Working Girl, with music by Cyndi Lauper. What do you look for in a potential project? What gets you excited? How does a project makes me feel emotionally – can it be cathartic and transformative? How is the author-producer relationship – do I like the people? What are the structure and economics of the deal – is it fair and financially exciting for both the creator and myself? However, overall, it’s about the connection with the creative team. Life is short, and not every project that is creatively exciting is going to be worth time away from my family. The deal-side of theater is very interesting to me and I have been lucky enough to access a lot of different and exciting deals, which is doable given my financial background. I’ve also been lucky to learn so much from some of the leading producers and lawyers in this industry. Your background is rooted in Wall Street – what made you want to make the switch to commercial theater producing? How has your experience on Wall Street informed your work now? My background from Wall Street, where I was first an equity analyst and then a partner at an investor relations agency, informs everything I do. I’d like to make an impact in commercial theater by simply setting the gold standard of communicating with investors as a lead producer. Co-producers can’t run the business narrative of a show because they are at least one degree away from the decision-making and don’t always have the entire picture of what’s going on. I know how it feels to invest in a show and not be communicated with or consulted, and then be surprised when things don’t (or do) workout. I also know how it feels to be told one thing and then learn another. Building trust with investors is important. It’s all about managing expectations and understanding what your investors want from the investment. Consistent and transparent communication is key, and I don’t see an industry standard – although I am not entirely convinced there actually can be an industry standard in commercial theater, but that’s a separate discussion. Some of the leading producers – the ones I look up to – are quite good at communicating, but not all of them. I’d like to establish my own best practices for my investors, and I am doing that by simply lead producing my projects with the communication strategies I formulated in my prior life. As for what made me make the switch… I grew up in the theater and was a classically trained vocalist. Like most people in this industry, it started when I was very young and had dreams of being on the stage. Years later I realized that the skill set I had developed professionally was very relevant to producing, so I set out to combine my investor, financial, and project management experiences with my experiences in musical theater. Additionally, my husband and I were blessed with two children and I thought that producing theater would allow me more control over my time and the ability to spend more of it with my family. So far that is only partially true, but I am appreciative of how flexible many theater people are, like when one of my kids gets the flu and I have to reschedule an appointment. I can often have a child in tow when I see a show or have a meeting! Those parts I really love! Do you have any advice to aspiring producers? The obvious advice would be to spend time with writers and get a good sense of what stories you want to tell. However, I think the best advice is for aspiring producers to go to law school and become wise as an I.P-focused entertainment attorney. I regret not doing that. The establishment and negotiation of rights is a part of the business I find exciting, as well as a differentiating skill set. What’s a question you wish I would ask you, and what’s your answer to that question? Who do I want to work with in this industry?